& That makes sense. Because, let’s face it, root canals don’t have the best reputation. A root canal doesn’t have to feel any different than having a cavity filled. There’s a way out of the pain you’re experiencing. There’s a brand new approach to the traditional root canal. And the results couldn’t be more different. Ready to discover the GentleWave® experience? This revolutionary, minimally invasive approach to root canal treatment is consistently delivering a higher standard of clean. Better outcomes. Less pain. Shorter healing times. Millions of teeth are treated and saved each year with endodontic treatment, or root canal therapy. At Advance Dentistry, root canals are performed in an effort to save a tooth that’s in danger of being lost to a severe threat (such as decay or trauma). The pulp cavity houses nerves, blood vessels, and connective tissue. Unfortunately, when there’s a crack, break, injury, or deep cavity within the tooth… the pulp cavity can become inflamed or infected. If that inflammation or infection is left untreated, it can result in pain or an abscess (a buildup of pus that typically involves painful swelling). 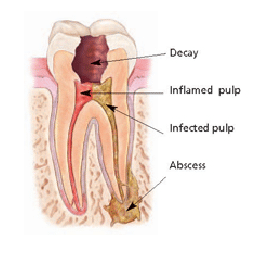 If an abscessed tooth is not treated appropriately, it can lead to even more serious and dangerous consequences. GOT IT. WHAT COMES NEXT? filling and sealing the canals and pulp chamber to prevent bacteria from entering. After the procedure, the tooth functions just like any other tooth. With proper care, most teeth that have had root canal treatment can last as long as other natural teeth — often for a lifetime. Have you been told that you’re in need of a root canal? Chances are you’re looking for any other possible route to a solution. That’s entirely understandable. The traditional approach to root canal treatment is not known for being easy on the patient. And the sad truth is, standard root canals aren’t known for being particularly effective, either. A series of files are inserted into the infected tooth. These instruments are used to remove the debris and tissue that can cause infection to spread within the tooth’s roots. Those root systems, however, are made of entire networks of canals. And, you guessed it, those canals are extremely complex. They are not only filled with twists and turns, but are also lined with microscopic places that provide ideal hiding places for bacteria. Cleaning all of the twists, turns, and microscopic hiding places with nothing more than a “series of files”…? Simply put: It’s just not effective. Any bacteria that gets left behind — as is often the case with traditional root canal treatments — will continue to multiply. This is why these procedures are typically accompanied by prescription medication. 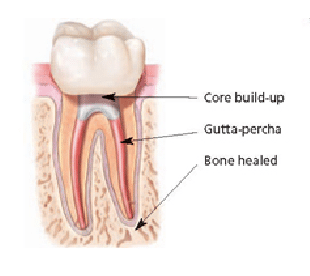 This is also why one standard root canal procedure can sometimes lead to another one further down the road. A combination of advanced techniques — fluid dynamics + acoustic energy — guides fluids through the tooth’s entire root canal system. This means that all of those twists and turns (and yes, even those microscopic hiding places) are thoroughly cleaned and disinfected. TAKE THE FEAR OUT OF ROOT CANALS. You can now breathe a sigh of relief. With the groundbreaking GentleWave® procedure — and the comfort provided by I.V. sedation — there’s finally a real alternative. Serving patients & families from across the Tri-State — from Cincinnati to Northern Kentucky, Indiana, and beyond.